Google Maps is one of the best map & navigation services out there and the search giant is bringing regular updates to make sure it remains the first choice of people. The company just started rolling out offline navigation features for Google Maps, which is surely an icing on the cake. Honestly, Google’s offering leaves not much to be desired but nothing’s perfect and nor is Google Maps. That’s the reason we need some alternatives and the good news is, unlike most major apps & services, there are a number of great mapping services available. Why we need Google Maps alternatives? 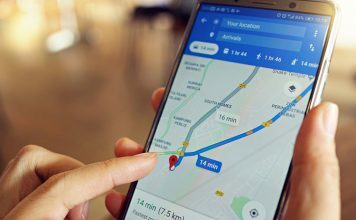 Google has worked hard to make its maps service a great one but there are some issues and although they are not a deal breaker for everyone, they might be important to some people. Firstly, Google Maps still lacks a few features like multi-stop navigation, which has been a much demanded feature. We would also like other mapping services from the company like Street View and Google Earth to be integrated in Google Maps. Another qualm we have is while Google acquired Waze a few years back, it is yet to implement its intuitive features like real time updates of localized weather, road openings or closures, accidents etc.. in Google Maps. Google Maps is pretty accurate mostly but it has faced some issues in some countries due to various regulatory rules. It is highly inaccurate in countries like China and North Korea due to the fact that company has leased the map data for these countries from local companies. Another important reason on why we need Google Maps alternatives is Google’s data logging complaints. Reportedly, Google uses location data & activities of users on Google Maps to leverage its ad revenue programs. Considering all the points, we do need some decent Google Maps alternatives and thankfully, we have some mapping services that can go head-to-head with Google Maps. 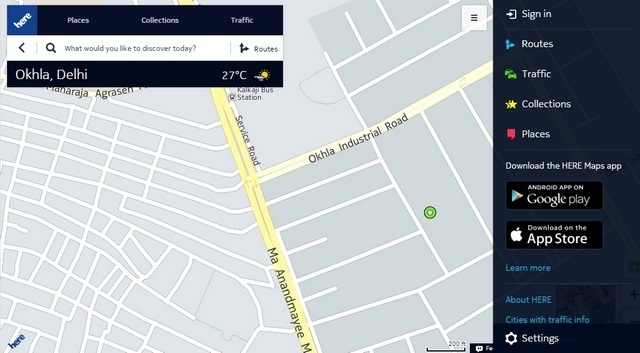 Nokia’s Here Maps, which was recently acquired by German carmakers Audi, BMW and Daimler has been a name to contend with in the mapping space for quite some time now. Here Maps is available as an online map tool and an app on Android, iOS and Windows Phone. It also powers a number of car makers’ GPS systems along with various other services like Bing Maps, Foursquare, Facebook, Yahoo Maps, Firefox OS, Tizen OS and more. Here Maps brings accurate public-transit & indoor maps with traffic details, reviews & ratings of places, private location sharing and more. Its USP all these years has been its prized offline navigation feature. It lets you download the maps of cities and even countries for future offline turn-by-turn navigation. There’s offline support for more than 100 countries including US, UK, India, France, Canada, Italy, Brazil, Spain and more. Turn by turn navigation is available for transits, personal vehicles and walking. Here Maps also compared its offline capabilities to that of Google Maps and it won by a long shot. So, if you want anything as reliable and feature rich as Google Maps, Here Maps should be the way to go. We are pretty sure you won’t be disappointed. 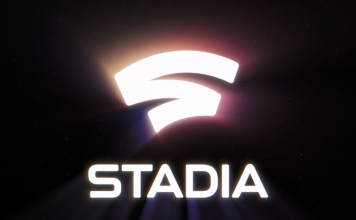 Compatibility: Android 4.1 and up, iOS 7.0 and up, Windows Phone 8 and up. Navmii, previously known as Navfree is a very popular mapping app available on Android, iOS and Windows Phone. Navmii, like other apps on the list covers up whatever Google Maps is missing. It brings real time updates like traffic details, roadworks and accidents. Voice guided turn-by-turn navigation is supported with alerts for traffic, speeding, hazards and safety cameras. There’s also support for offline maps that are saved on your phone along with smart auto-rerouting depending on road & traffic conditions. Navmii also comes with better and local smart search, thanks to its integration with TripAdvisor, Foursquare and What3words. The app also has Google Street View integrated, which is certainly great considering Google Maps doesn’t have it. It also shows you the nearest parking spots, gas & petrol stations and more. Navmi also has a cool Driver score and analytics, which lets you know more about your driving skills. Navmii is free on the respective app stores with some in-app purchases for certain features. Also, you will need to download the maps of your region when you first open Navmii and only then you will be able to use the app. Navmii – Android, iOS, Windows, BlackBerry 10 (Free with in-app purchases). Compatibility: Android (Varies with device), Windows 8 and up, iOS 7.0 and up, BlackBerry OS 10 and up. Sygic Maps is one of the most downloaded and popular mapping apps and chances are you might have heard of it. 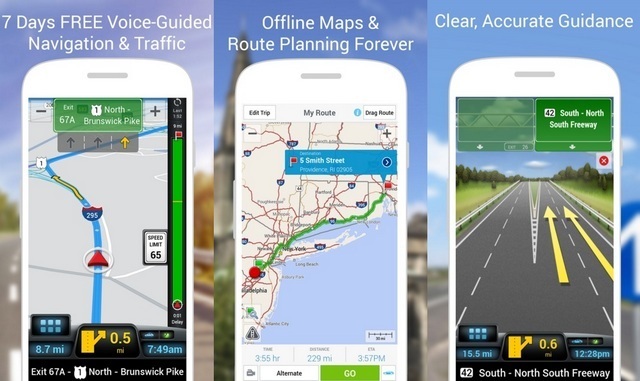 Sygic: GPS & Maps is powered by the very capable TomTom maps and it’s deservedly one of the most installed mapping apps. Talking about its features, it supports offline maps and voice guided turn-by-turn navigation in various languages. There’s also support for 3D orientation, pedestrian navigation, lane guidance, junction view, alternative routes, drag & drop route editing and car audio integration. The app also brings you alerts for speed limits, fixed speed cameras and police traps. Along with all of that, the app brings millions of POIs (point of interests) in the app itself. There’s also Travelbook, that keeps track of your activities to bring you stats based on your travel habits. There are also various add-on features that are available as in-app purchases like heads up display (HUD), celebrity voices for navigation instructions, waypoints, car audio integration and more. 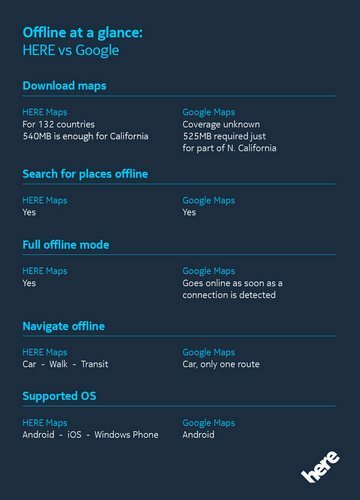 Offline maps are available for a ton of countries including India, US, UK, Kuwait, Australia, France, Germany, Russia and more. Sygic is available on Android, iOS and Windows Phone. 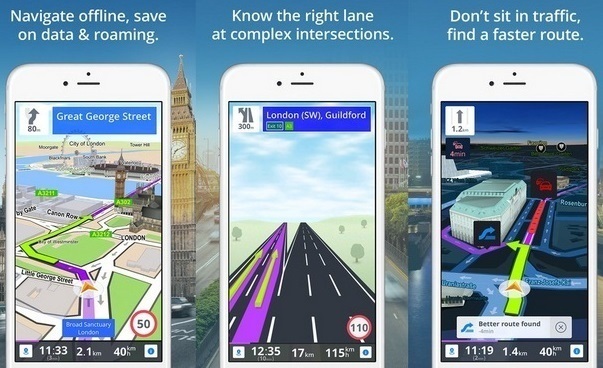 It’s available for free but the free version is quite limited and you will have to get the premium version through an in-app purchase to use features like voice guided navigation, speed alerts & warnings, lane assistance and more. Similar to Navmii, even Sygic requires you to download the map of your region to start using the app. Compatibility: Android (Varies with device), iOS 7.0 and up,Windows Phone 8 and up. Scout is another great map app available on the two major platforms, Android and iOS. It brings all the great features we have come to expect from modern day map services and more. Along with the features, Scout is a pleasant app with a very intuitive UI. It supports Android’s Material Design UI on Android and iOS’ latest features like 3D Touch on iPhone. Scout brings you voice guided turn-by-turn navigation with real time updates on traffic & other commute related details. 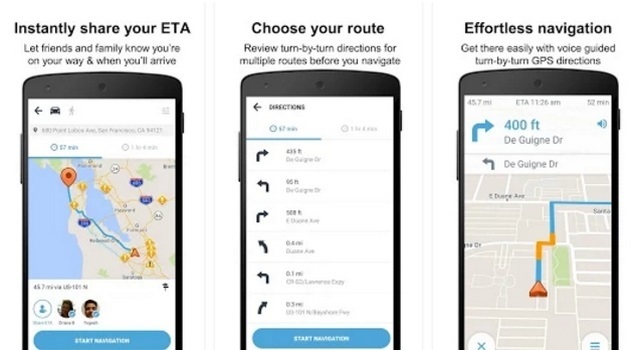 The app also lets you re-route your way by just a swipe. It also supports multi-stop navigation and lets you discover new gas stations, hotels and restaurants. There’s also support for Night mode, which makes sure the maps have better visibility at night. Scout lets you share your ETA with friends & family on the go, so that they know that you are indeed on your way. There’s also ability to create shortcuts that show you the ETA, drive times to work & home and more. The app also lets you create a group of friends who use Scout to plan meetups and more. You can also send instant messages to the people on the group. As Scout’s description says, it’s a commuting as well as a communication app. 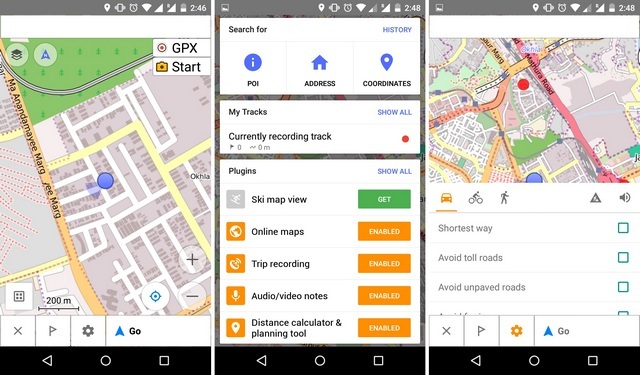 Scout powered by OpenStreetMaps platform is available for free on the Play Store and iTunes but there are in-app purchases to get offline navigation features. Scout is currently available only in the US. Compatibility: Android 4.0 and up, iOS 7.0 and up. OsmAnd is one of the highly rated map apps on Android and iOS app stores and deservedly so. It not only brings you the regular map features but it also includes some features aimed at cyclists and people interested in skiing. OsmAnd brings you offline maps and navigation as well as a fast online navigation option. 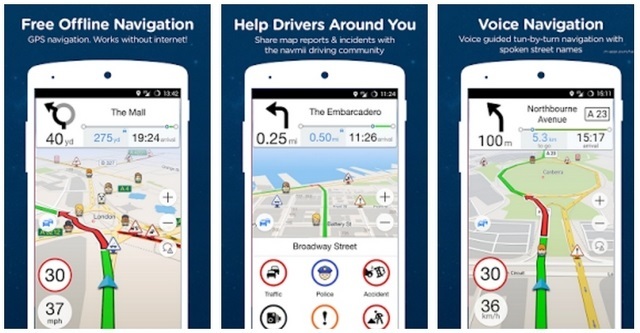 The app also features voice guided turn-by-turn navigation with alerts for traffic warnings, crosswalks and speed limits. It also packs multi-stop navigation, lane guidance, ETA, auto re-routing and you can search by either address or even coordinates. Even the map viewing experience on OsmAnd has been developed with much care, as there’s ability to display specialized online tile maps, overlays like touring and more. You can also choose whether the name of places are displayed in English, local or phonetic language. Offline maps in the app also include bike, foot and hiking paths and there’s ability to display contour lines, hill shading, speed and altitude. 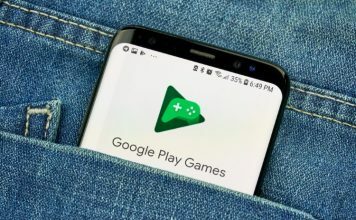 Features like contour lines, nautical charts, parking places and ski maps require paid plugins, that can be installed separately from the play Store. Moreover, the app combines the data from OneStreetMap and Wikipedia to bring you the best info on point of interests. The app is available in a free version as well as a paid OsmAnd+ version, which brings unlimited map downloads, Wikipedia POIs (point of interests) and more. Along with Google Play Store and iTunes, OsmAnd is also available on the Amazon App Store. Compatibility: Android (Varies with device), iOS 7.0 or up. CoPilot app has been here for a few years now and it has made its way to the list of most popular map apps. It claims to brings great accuracy & reliability and it indeed fulfills that promise. Coming to the features, CoPilot like most other apps on the list brings voice guided turn-by-turn navigation with text-to-speech, multi-stops and offline maps support. It also has its own ClearTrip feature, which helps users out at complex junctions with lane indicator arrows, highway exit posts and more. The app also features “ActiveTraffic”, which brings real time active traffic reports and predictive routing to save users from busy routes. “CommuteMe” is another cool feature in CoPilot, which learns your favourite routes and checks the traffic on those routes for you. It also brings you accurate ETAs and alerts for speed limits, traffic warnings and more. Local search in the app is powered by Yelp, Wikipedia and Google, so POIs are bound to be good. CoPilot’s navigation and ActiveTraffic features are available as a 7-day trial in the free version but you can make in-app purchases to get the feature. Offline maps are available for various countries like USA, Canada, Australia, New Zealand, France, Greece, Poland, Italy and more. Similar to some other apps on the list, it requires you to download maps of the region you are in before you can start using the app. CoPilot is available on Google Play Store, Amazon App Store, iTunes and Windows Store. Compatibility: Android (Varies with device), iOS 6.0 or up, Windows Phone 8 or up. Mapquest is another feature-rich maps service, which is powered by the popular and reliable OpenStreetMap project. It is available as a website and an app for Android, iOS and Windows Phone. Mapquest is a cool mapping experience and it brings features that are missing in Google’s offering. It has multiple modes of transportation integrated including the likes of Uber and Car2go. There’s support for real time traffic and other details like accidents, road openings or closures. The popular mapping service also supports voice guided turn-by-turn navigation for driving and walking. It also supports auto-rerouting to bring you the shortest routes to your destination along with multi-stops. Along with all the real time data, it also shows restaurants, hotels & gas stations nearby and you can even compare their prices. It also has integration with services like OpenTable and GrubHub, which lets you make reservations and order food on the go. That’s not all, Mapquest also brings you membership-free road assistance like towing in case you have a flat tire or broken engine. While Mapquest works like a charm in the US, it can be a little inconsistent in other countries. Compatibility: Android (Varies with device), iOS 7.0 and up, Windows Phone 8 and up. iGo is an iOS exclusive app that brings all the advanced features we expect from a navigational device to your iPhone or iPad. iGo might be a little pricey but its advanced features make sure it’s worth your buck. It brings offline voice guided navigation with text to speech support and fast, easier routes. The app also supports multi-stop routes and it automatically re-routes in case you go off the track. 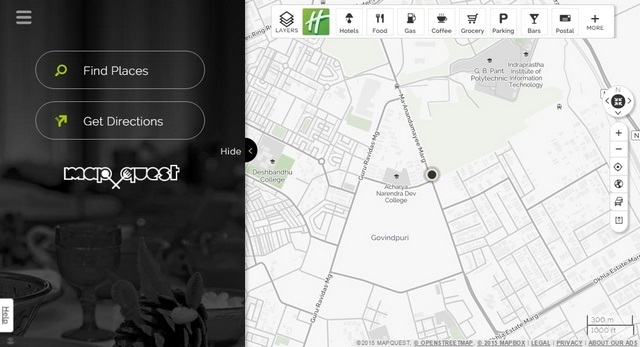 iGo not only lets you navigate to set locations but also to pictures and co-ordinates. 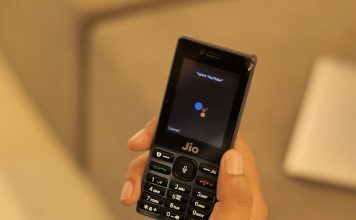 Along with that, it features 3D junctions, lane guidance, local & POI search, signposts and smart keyboard that remembers your navigational history. That’s not all, as iGo also brings 3D visualization, TTS (Text to Speech) Pro, day & night mode, “Here” powered local search, free live traffic, car optimizations and more. There are also other handy features like quick menu, vehicle profiles, customer care support, emergency “Where am I?” feature and a cool Explorer package. The app is available only in a few regions that include North America, Middle East, Europe, Western Europe, Brazil, Israel, Russia, Turkey, Hungary & Romania and Italy. The app is pricey but the experience makes it worth it. Compatibility: iOS 4.3 or up. The aforementioned apps including Google Maps are great but they aren’t really aimed at people who make their way across the city through public transportation. This is exactly where CityMapper excels, as it makes public transit a lot easier, thanks to its real time data and other features. CityMapper includes a multi-mode journey planner that covers most transit ways including subway, bus, metro, cycle, trains, rail, tram, ferry, Uber, car sharing and more. 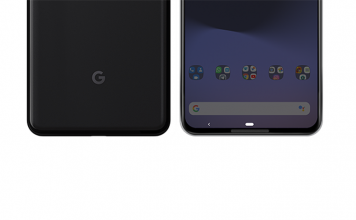 It has a “GO” assistant feature, which helps you out with real time suggestions and instructions. The app has Uber integrated for cab booking and Foursquare, Yelp and Twitter are integrated for live transit updates. CityMapper includes transit maps and real time alerts for the next bus, timetables or any disruptions. It lets you share your coordinates or status easily through WhatsApp, Twitter or email. Moreover, the app also supports Android Wear and fitness features like “Calories”, which is a distance tracker that lets you know the calories you’ve burned through walking or cycling. CityMapper is only available for a few major cities like New York, San Francisco, Washington, Chicago, Boston, Toronto, Vancouver, Hong Kong, Tokyo, Singapore, London, Paris, Belgium, Barcelona and some more. While CityMapper does use Google Maps API for its app, its features sets the app poles apart from Google’s offering. The developers are also constantly working to add new cities and you can vote for your city here. 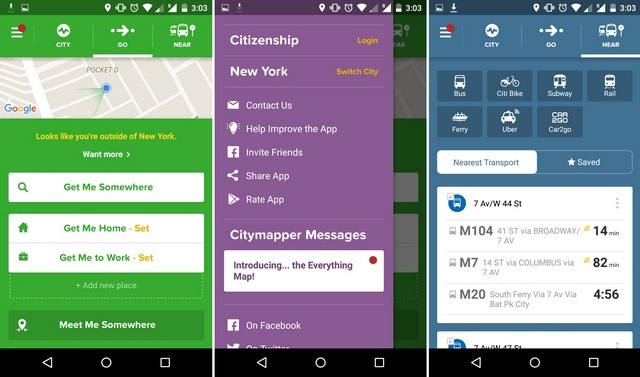 CityMapper can be accessed from your preferred browser or can be installed as an app on Android and iOS devices. If you are looking for an app that focuses on your hiking and biking needs, Komoot is the one you should install. 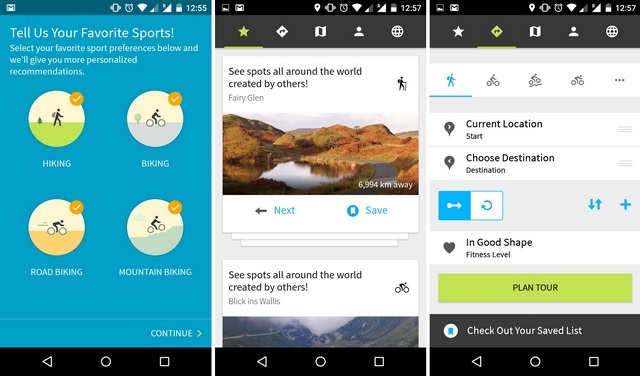 Komoot is the perfect app if you go on adventures often and love biking & trekking. It uses topographic maps with turn-by-turn voice navigation and it also recommends tours that suit your fitness levels & preferences. There’s ability to check tour details like surface, difficulty, elevation & distance and when you are travelling, it keeps you up to date on the ETA, along with details on how much distance you have covered. Komoot “Highlights” are the recommendations from different users and you can add yours as well. You can add pictures, tips and even vote on various tours. The app also allows you to download maps for offline usage. It also syncs with your different devices, so that you don’t have to get all the details from scratch. Komoot is available for Android devices and iPhone, so if you are an outdoor adventure enthusiast, cyclist or hiker, do check out Komoot. Compatibility: Android (Varies with device), iOS 8.0 or up. 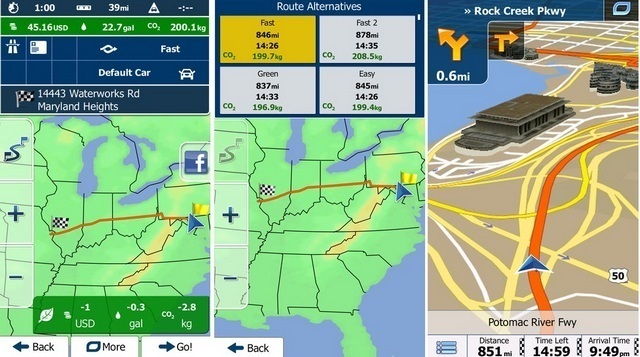 inRoute is an iOS exclusive app but it is arguably the best route planning app available to use. It is the only voice guided navigation app that checks your routes automatically and brings you real time weather notifications. The app lets you plan your routes based on various characteristics like weather, elevation, curviness, daylight, safety and more. It shows these characteristics in interactive charts, so that you can see if a certain route is good enough for you or not. You can also easily shuffle between routes to change stops in between or if you think another route is shorter. Other features of the app include custom routes, search in routes, ability to set departure & layover times, save routes or places and more. 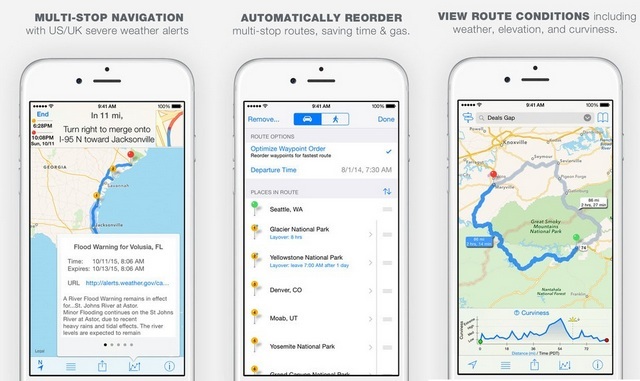 It also lets you export routes to Apple Maps, Google Maps, MapQuest and GPS devices as well. inRoute is available in a free version but it’s a bit limited. The premium version of inRoute lets you add 25 places per route, optimise waypoints, iCloud sync, advanced route search and more. Compatibility: iOS 8.0 or up. So, these are some of the best Google Maps alternatives. Check them out and let us know which one is your favorite in comments section below.